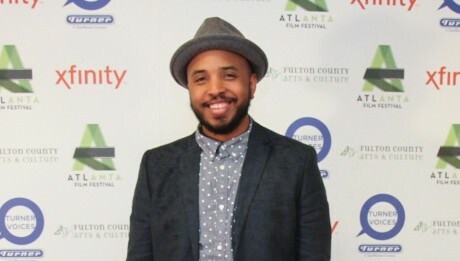 Since the age of nine, Justin Simien knew that he wanted to be a filmmaker. Years later after attending college at Chapman University in Orange County, California and working several Industry jobs as a publicist and marketing specialist, Simien’s dream is now a reality. As one of the most provocative feature filmmaking debuts in recent years, Dear White People directed by Simien, is a satire that follows the stories of four black students at an Ivy League college exploring racial identity in post-racial America. Justin Simien. Photo by Yale Zhang. The winner of the 2014 Sundance Film Festival’s – U. S. Dramatic Special Jury Award for Breakthrough Talent, Dear White People is based on the concept trailer that he put together to secure crowdsourced funding and became a national conversation piece after going viral on YouTube. An admitted cinephile at heart, the film is very aware that it’s a movie, and makes several homage references to other filmmakers. But ultimately, Justin Simien is interested in holding a mirror up and saying something about the human condition with his movies. Dear White People is playing in select D.C. area theaters in limited release, and opens nationwide on October 24. Sydney-Chanele: Why did you need to tell this story? What sparked the genesis of the idea? Was it a college project? Justin: I always wanted to be a filmmaker, and it was always a feature in my head. It really wasn’t a project for anything in particular; I was sparked by my black experience. In college I felt like it was something that wasn’t really out there in the culture. I thought it would be an interesting way to talk about the black experience – a new way to talk about – and to make a movie that was kind of a throwback to the ones that I love. The stuff that came out of the Black Art House Movement in the late 80’s early 90’s that had sort of died off by the time we got to 2005. When did you begin writing Dear White People and how did the script evolve? In 2006, I had a first draft, it was called Two Percent. It started out as a feature film. I always saw it as a multi-protagonist comedy about navigating the black and white world at a mostly white college. It was certainly more anecdotal, a little more Robert Altmanesque. There were lots and lots of characters and it had a very meandering plot. There really wasn’t like there was a political, satirical bite to it. It really was just sort of me trying to articulate my experience – my black experience at the time. Over time we tightened it down to four major characters and that made it much more of an identity story. It was meant to be about the American Black experience -at -large through the microcosm of this college, as opposed to being a faithful representation of college life per se. You are a Writer/Director/Producer and Editor. You started this film while in college, but I’m curious as to what other short films you made. Did you go to school with the intention of making a feature film? Yeah! I went to film school because I knew since I was about nine-years old that I wanted to make movies. I was a theatre major at a performing and visual arts high school in Houston, and so I was always sorts of in the arts world. It was always sort of the passion and dream. I didn’t edit the film – that was a guy named Phillip J. Bartell – but I certainly edited most of my work up until that point. I made lots of shorts. Every year there were several classes that required several short projects. My senior thesis was a short film called Rings (2006) that was about marriage rights. It was sort of a tongue and cheek back door way of talking about marriage rights where you see these two women on a wedding day, and you see lots of protests and you are led to believe that people are protesting over a gay marriage. The twist of this film is this that we are actually in the past and black woman is preparing to marry her white husband and that’s what they’re protesting. It’s the connection that the Bible is still being used inappropriately to discriminate and take away people’s rights. That was my senior thesis. So in a way I think I was interested then and am still interested in holding a mirror up and saying something about the human condition with my movies. That’s interesting. Is Rings something you be comfortable with having as a feature on the DVD of Dear White People when it comes out? I don’t think so. (Justin laughs heartily.) I was fine with what it was at the time. You know I don’t have enough perspective to look back fondly on it yet. That’s funny. Let’s go back into the filmmaking. What camera did you use to shoot Dear White People? And, how did you put together your all-female producing Dear White People team? We used the Epic Red camera. It all started in 2009, Ann Le was one of my friends -we worked together at Focus Features – she actually produced of my web series INST MSGS (Instant Messages,2009) and was one of the first people to come on board. With Instant Messages people would submit their instant message conversations and they would also submit Craigslist ads. It was online chatter, and each week I would adapt that into a new short film. The experimental web series was distributed by Revision 3 and we got nominated for a Streamy (Streamy Award). My best friend, Lena Waithe, also came on board to help figure out how to get this thing off the ground, as did Angel Lopez. The three of them were my original producing team. Once we got to the stage of getting the movie made, I made a concept trailer with my tax return. Once that went viral through the attention of Stephanie Allain-Bray, world-famous Producer, kind of responsible for Boyz in the Hood (1991) happening, Black Snake Moan (2006) and Hustle and Flow (2005) and Beyond the Lights(2014) coming out this year. She came on board as an Executive Producer and brought with her Effie T. Brown to help translate the logistics of shooting a movie. Effie has extensive experience at producing films and getting into Sundance. Stephanie’s Assistant, who eventually became the Associate Producer Mel Jones, saw the trailer and gave it to Stephanie and said, “Take a look at it.” The final producer who came on board was Julia Lebdev who’s company Code Red Films actually financed the project. That sounds like a great team. Now, more film geek talk. I can tell from talking to you because you’ve already mentioned Robert Altman and you said that you wanted to be a filmmaker since the age of nine that you probably consider yourself a cinephile. And, you’ve compared Dear White People to Do the Right Thing meets The Royal Tenenbaums. With all that in mind, name five of your favorite Criterion DVD’s. Or if you not sure what’s what, then name five of your all-time favorite films. I don’t know which are Criterions, but I can tell you my five favorite films. 2001: A Space Odyssey is my favorite film of all-time. I also love Barry Lyndon which is another Kubrick film. Do the Right Thing, which I know does have a Criterion DVD and is also a favorite film of mine. I really love Cabaret, the Bob Fosse musical and then in the fifth spot I’d have to say goes to All About Eve. There are a lot of movies that I love. Following that line of the thinking . . .Who is your favorite filmmaker? ( I think I can tell from that list you just gave.) And, what three filmmakers most influenced your filmmaking style? I think Stanley Kubrick is the one I most admire. First of all he is an American Master. I think that 2001: A Space Odyssey is the greatest accomplishment from an American filmmaker. That’s just, you know, my humble opinion; he was a man of great integrity. It took the culture a few years to catch up to him. Kubrick’s approach to filmmaking, his style, was so ahead of his time. He was so ahead of his time to make these Masterpieces and be okay and not mentally break-down, for the fact that people didn’t really get them sometimes up to ten years after he made them. I just have a lot of respect for him as a filmmaker. In terms of style, Kubrick has an influence on everything I do, because I’m just a big fan. Obviously, I’m influenced by Spike Lee as well. And third, I would say is (Ingmar) Bergman to have an influence on me in that way. One of the reasons it took Kubrick a while to be fully recognized for his genius is because he made films of all different genres, never staying with the same type of film. Do you envision the same for your own future filmmaking – making all different types of films? I think so. I don’t have any interest in repeating myself and making the same film over and over. I love movies; I love every genre of movies. I just love stories as long as they have something to say and are holding a mirror up in a new interesting way. I’m kind of in. Who wouldn’t love to have a career like that? You just made an important point about “Having something to say.” Why is the message of identity so important for you discuss with Dear White People? When this idea came to me I thought it was great way to talk about the universal issue through a Black lens of my point of view, adding a new angle to it. That is what I am always looking for when I am looking at stories. I’m not sure this is a fair question because it’s such a big one, but what in your opinion is the Black American experience today? Some might say we are in a post racial place. How do you view state of Black America today in the Obama age? I think it is multifaceted. I think that is one of the big take aways. I think that we are getting past the idea that there is only one authentically Black experience. There are as many Black experiences as there are Black people. I think something we all relate to is the dance between how the people of color are perceived and all of the assumptions people of color constantly have to walk into and through under that pressure to find out who they really are. I think that actually is a unifying experience we all have as people of color. How did you come up with title – Dear White People – and why did you decide to stick with it? We already know it wasn’t the working title when you first started? The title came up around the time of the Twitter account. I was tweeting as Sam @dearwhitepeople, and was just developing her voice, testing out her jokes, and seeing how people at large responded to that voice. Then, that informed the script. And it was just so catchy; it was just so obviously a title – an certainly better than Two Percent. So I stuck that on the title page and kept going. Did you test any other character voices on your DearWhitePeople Twitter account? I did not actually. Sam was at the point in time, someone who I was still trying to crack. Whatever she did had to be funny and controversial and still walking that line and that was something I was still struggling in those writing stages. That’s a very smart way to get feedback and generate buzz about your work. No one knows a film better than the Director, especially one who is the Writer/Director. Were there any surprises about how the film has been interpreted that you never thought of or intended? Yeah. Part of it was the process. I couldn’t have predicted all the things happening in the media that sort of reflects the things happening in the film. There is an uptick in blackface parties, and certainly the post racial bubble of America being popped through all of these stories -the most recent being the tragedy in Ferguson. It’s interesting how recent events have mirrored some of the elements in the movie. But the response to the title, Dear White People, from people who claim reverse racism is an interesting topic that is talked about subtlety in the subtext of the movie. The idea of white privilege and the illusion of reverse racism is something that I think I would love to explore if I am allowed to continue with these characters in another form. The distinction between racism and prejudice is something people don’t quite get yet, and I think that is an important distinction to make. To understand that a movie called Dear White People does not have the same effect as actual racism. I think that it something very well meaning liberal people, some don’t quite understand yet. I can’t say controversy over the title was unexpected, but the tenor of the controversy provoked a lot of interesting conversation that would totally inform the piece in a different way if I wrote it today. Wow. That says a lot . . . Really interesting. What was your biggest challenge making this film? I know financing is always an issue, but what specifically was your biggest challenge? And now that the film is made and theatrically released, what do you view as the biggest challenge? I’m going to give you the crunchy granola answer because it’s the most truthful. The biggest challenge was my own self-doubt. Believing that I could do something that was authentic to my voice but that was totally different and had no models, and on paper had a very limited chance for success for finding finance. To continue to believe in myself and work towards getting the film done even though we were told, “no” so many times. And, so many ways in which we thought the film would happen fell apart. So to get through all of the issues about not having enough money and having enough believe in myself and the project to keep going, was the hardest part. That’s a journey that I will probably be on for the rest of my life but overcoming the self-doubt was a real challenge for me. I think now that the movie is done, the challenge will be to make sure we release and connect with an audience in a way that really does prove to Hollywood and the Industry that films like this do have any audience and can make money, and that people are hungry for different versions of shared experiences. And I don’t just mean Black people. There was a time when there were people of color in movies and they weren’t just Romantic comedies or historical slave movies. You had everything, you had your Art House, you had movies for adults, you had Thrillers, you had Comedies. America is more diverse than it ever has been. Courtesy of Dear White People. We have to start telling interesting, complicated stories about the human condition that feature people that look like America. That’s really important for our culture, to make sure we can see ourselves in it. To me that’s the challenge – to make sure we have a successful movie so that other movies can be made -because I’d like to go just see some. I’d love to see some other people get a shot. Dear White People opened October 17, 2014 at Washington area theaters. Here are the DMV theater showtimes. Cinema Speak with Sydney-Chanele is a column that embraces the landscape of film, filmmakers, and film festivals. This will be a canvas where film reviews, and in-depth interviews into the filmmaking process will be shared, and the world of cinephiles will be celebrated. A dedicated space to cinema outside the mainstream, the emphasis of Cinema Speak with Sydney-Chanele will be foreign cinema, independent films, documentaries and the filmmakers who make them.